For my awareness campaigns, I’ve always implemented custom audiences first for my clients. No matter what size their budgets, it’s important to try to capitalize on our target audience first before broadening our reach. Custom affinity audiences used to be my go-to for YouTube campaigns because I could create audiences from a combination of keywords and URLs based on people’s interests and habits. They still work very well for many of my campaigns. I suspect many of you do the same. These days, though, we can get more specific with our audience targeting on YouTube thanks to custom intent audiences for video campaigns, which use broad-match search terms people have actually searched on Google. Unlike affinity audiences, this allows you to try to target people who were actively searching for your product or service. EDITOR’S NOTE: Joe’s a pro, but if you’re still a little unclear on the difference between custom affinity audiences and custom intent audiences, just remember the following: Affinity audiences are based on people’s general habits and interests when browsing online (i.e., reading a lot of marketing blogs), while intent audiences target people based on what they’re currently searching for (i.e., “landing page builder”). You basically have to start with converting search queries. This is the no-brainer—as in, must try immediately—custom intent audience! Think about it: Google Ads tells us what our converting visitors were actually looking for on Google. Don’t we want to try and get in front of more prospects like these? Of course we do! Use the search terms report in Google Ads to build a custom intent audience based on searches that have converted in the past. If you have a lot of traffic, you may want to create a different custom intent audience from search queries in specific campaign sets. It’s completely up to you. Just make sure you use at least 50 keywords for your custom intent audiences. This is one Google best practice I agree with. From what I’ve seen in my own campaigns, the amount of keywords doesn’t affect the quality of performance, but I have seen it affect the number of impressions we get. Only segment your queries if you have at least 50 per campaign set to give your awareness campaigns more volume and reach from the start. Now hold on a second! I know what you are thinking. This can work for single-location small businesses. Or it can work for larger chains with a lot of brick-and-mortar stores. Create a custom audience to try to separate prospective customers who would prefer to visit your physical location and those who would be buying your products from across the country. Local search terms (like city names) and “near me” searches can be used to build very effective custom intent audiences. By separating out your local search terms, including the ever-popular “near me” terms, you can update your location targeting to better serve the campaign. If certain regions or cities get more searches, then create a local campaign covering that geographic area. Use video creative that speaks to potential customers within that area. If people in your area are searching for your products or services, a custom intent audience around these terms can easily help get in front of these new users. Building a custom intent audience around top selling products can be a great way for ecommerce sites to extend their reach. Can we just look at the product information we get in Google Ads to create this audience? You could, but Google Ads will never give you the full picture. Instead, for this audience, I like to rely on Google Analytics. Your converting search queries will only pull from your PPC campaigns, but Google Analytics will show you the best selling products when looking at all channels. 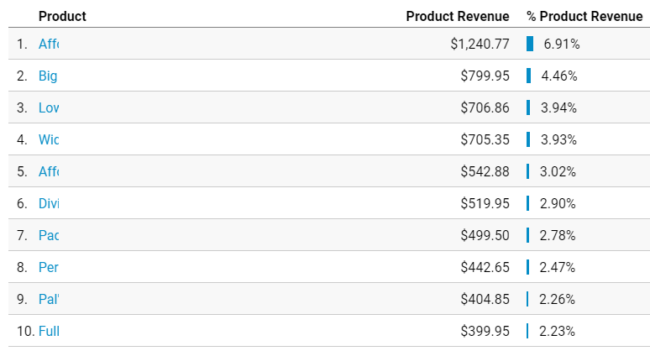 Google Analytics shows you what products are the best selling across all channels (not just paid). My main goal with this audience is to try to push more interest in my top selling products, but I can also use this to boost other products. Let me explain. You could have products that sell really well, or have really good margins, but they’re just lacking volume. Why? These products might just have a lack of awareness. So instead of an audience going after the most sales, you may want to look at “top selling” products as the ones making you the most profit. Again, there is no best practice here. Do what you think is best for your business. We are sticking with Google Analytics again. Odds are your company has a lot of visitors coming to your site via brand campaigns, organic brand searches, or through direct traffic. We won’t get the best data on what they intended to do or buy when they landed on your site. For this scenario, look at the Site Search report in Google Analytics. The Site Search report allows you to build yet another custom intent audience based on visitor interests. You might see a different list of products that people are looking for compared to the data you see only in Google Ads. 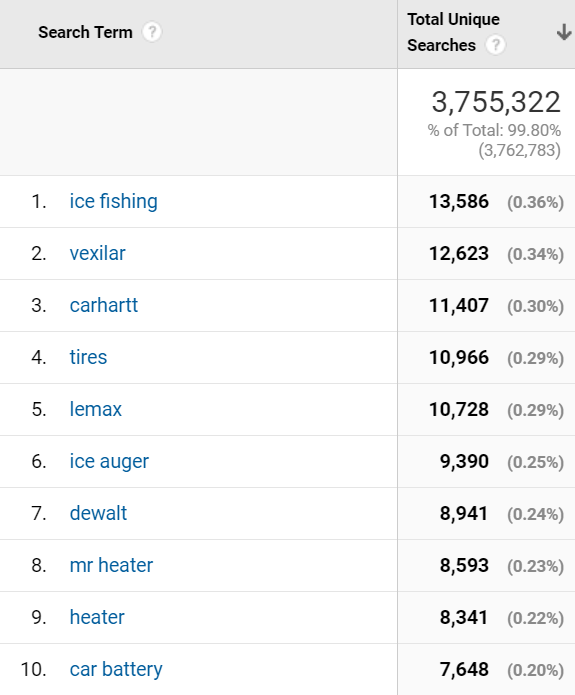 Even if you don’t see a list of specific products, the Site Search report might give you an understanding of categories that are popular for visitors at the moment. Use this information to test out some different custom intent audiences. EDITOR’S NOTE: It’s a bit sneaky, but custom intent audiences can be used for competitor targeting as well. Unbounce’s own Larissa Hildebrandt covered this topic in a recent blog post. Check it out. I only shared a few ideas I like to try first for custom intent audiences. No doubt there are many options I haven’t included in this post. Think of all the different ways you may want to segment search terms, keywords, or URLs to reach a new—but relevant—audience. Ever since YouTube introduced custom intent audiences in Google Ads, they have consistently been my top performing audiences for user engagement and even revenue for my TrueView for Shopping campaigns. 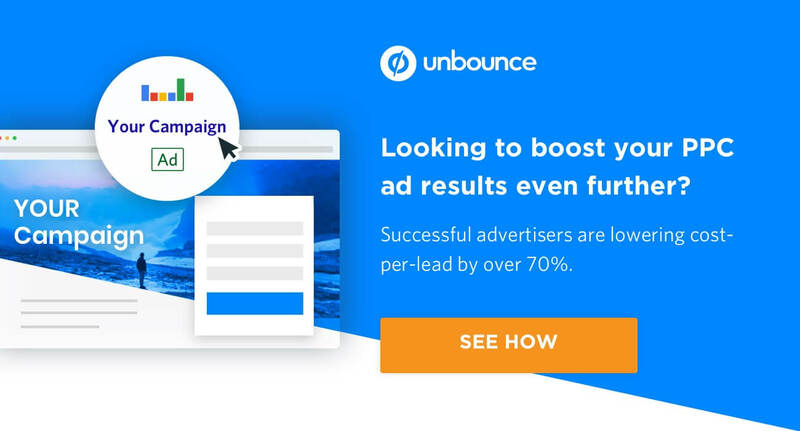 Test these out, and let the Unbounce community know which custom intent audiences you have tested in your campaigns in the comments below. Joe Martinez is the Director of Client Strategy for Clix Marketing. While he is hands-on in all aspects of PPC, his true passions lie in Display, Remarketing, and YouTube. He is a regular contributor to Search Engine Land, Marketing Land, and WordStream. He has also written for PPC Hero, SEMrush, Optmyzr, and AdStage. He has hosted webinars for SEMrush, Unbounce, Quora and Bing Ads. He regularly speaks at conferences such as SMX Advanced, SMX West, SMX East, HeroConf, Confluence Conference, Digital Olympus and more. Finally, he was named a Top 25 Influential PPC Expert by PPC Hero in 2017 and 2018.